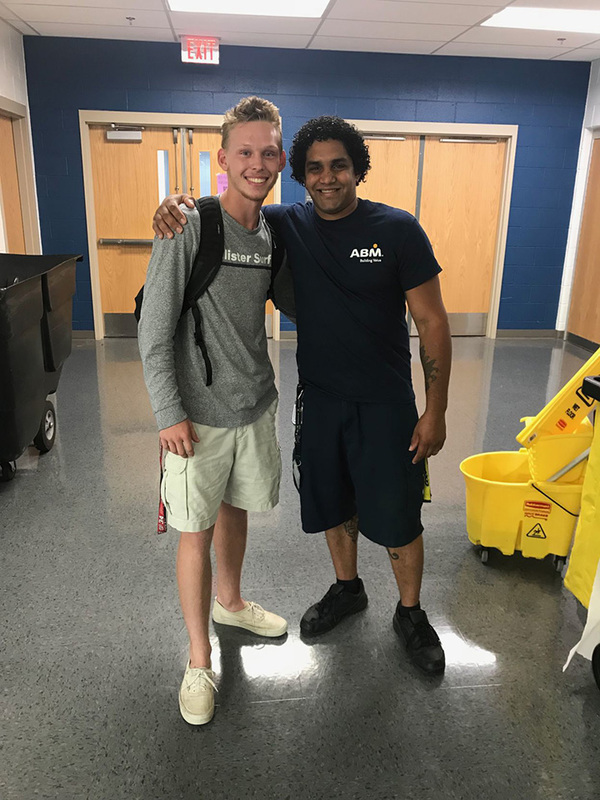 A heartwarming video of a high school student's gift to a janitor is going viral. Tristan McAlister, 17, is a student at Stafford High School in Fredericksberg, Virginia. Angel Echevarria, 31, is a custodian at the school and was homeless for four years. Despite their different backgrounds, the two struck up a friendship in the halls.
" McAlister wrote in a tweet. "I asked him what shoes should I buy and he picked out Jordan 8s and I asked if he had a pair and he said 'no I have 4 kids, I can't shop for myself' so today I surprised him." McAlister said he only recorded the video because his mom wanted to see Echevarria's reaction. She encouraged him to share it on social media, but no one expected it to go viral. Despite the difficulties he's encountered, Echevarria is "always happy, always smiling, always appreciative of his life," McAlister told The Free Lance-Star. "I'm so thankful to have met him," the teen said. "He gives me a different perspective on life."